In the Fall of 2007 while staying in Kathmandu with my old friend Lucy Needham I developed a habit of walking around the Grand Stupa each evening. It's located in an area known as Bodhanath where the Tibetan exiles congregate when coming to Nepal (who are still fleeing Tibet). Throughout the day the Stupa is a kind of circular magnet around which refugees, holy people and tourists alike walk in a clock-wise direction. Twilight seems to bring out everyone and it is an especially magical moment. I felt compelled to return each afternoon from a day of drawing in different parts of town. I was drawn back to the pungent night air filled with incense and a multitude of a sensations; the cacophonous sound of traffic horns and jet planes mingling freely with the chanting already thick in the air. Exactly ten years ago I was living here at the Belvedere with my friend Lydia who is also a painter and we spent that day trying to take care of a lamb whose leg was broken. At this time there was a shepard named Roger from Catalonia who walked his dog and troop of sheep four times a day up and down the small road which is below the house. Early each morning the sound of tinkling bells and his bellowing voice awakened us. Up to a large field about a half kilometer off the road for the morning, back for lunch, up again, then back home late afternoon was his daily routine. For us it was a wonderful way to mark each day of our life here in France. Roger was friendly and always shouted 'Salut' when he saw me coming out onto the terrace to wave to him. Once in a while a lamb with a broken paw would straggle behind crying pitifully which was painful to watch four times a day. That week it was too much for our city sensibilities and we asked him if we could take care of the latest invalid. Thinking we were a bit crazy but being affable about the whole thing he gave it to us much to our surprise. So on the morning of September 11th we took it to the Vet's in La Begude who probably also thought we were a little 'dramatic' and advised us that it had a broken leg and should be someone's dinner quite soon. We brought it back to Roger who promised he would put it in a small field next to his house. After lunch we each went into our retrospective studios and painted for the afternoon. 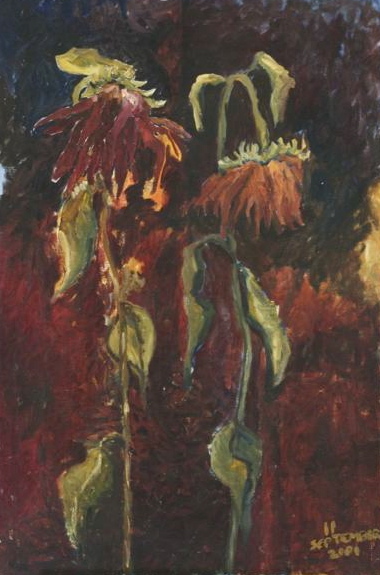 Lydia painted a portrait of two large dying sunflower plants (see top photo) They were slumped over and hanging to one side. 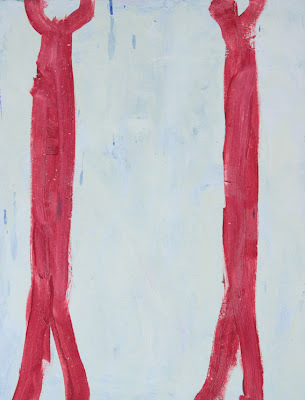 I worked on a few things but then started a painting of two red lines which go up and down a small canvas. I don't know why but I stopped and left it in that state and picked up something else. I found it was compelling to say the least.